Management is highly effective, and is enforced federally by the Department of Fisheries and Oceans, as well as by the Pacific Salmon Treaty and the Fraser River Panel. Total allowable catch is regulated during the season and is modified according to escapement numbers that are monitored twice a week. Sockeye salmon have life history characteristics that make them resistant to fishing pressure. Population abundance is healthy, with the exception of the Cultus Lake sockeye salmon, which are endangered. 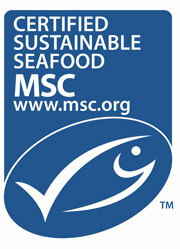 Mortality rates caused by fishing are sustainable. Bycatch is minimal since reefnets are highly selective, and non-salmonid species are rarely caught. Although only hatchery salmon may be retained by the reefnet fishery, and wild individuals are returned live, individuals from other sensitive or vulnerable salmon stocks are sometimes caught. Reefnets do not typically cause habitat damage since they are not in contact with the sea floor. However, the impacts of removing salmon from the ecosystem are not well understood, despite the important ecological role that the salmon play as a keystone species. Alaska except Annette Islands Reserve, South East Alaska, and Yakutat. Sockeye salmon start and finish their life in freshwater lakes and rivers, migrating to the ocean for the adult phase of their life cycle. Over thousands of years of returning to their natal streams to spawn, salmon have become reproductively isolated and genetically distinct from salmon in other river systems. Habitat degradation, changing ocean conditions and fishing pressure threaten many of these distinct groups of sockeye, with sockeye disappearing entirely from some rivers, particularly in Southern BC and the US Northwest. In other parts of its range, such as Alaska, Sockeye continue to return to their native streams in healthy numbers. Salmon have relatively short life spans and high reproductive output. Sockeye live for 4-7 years, dividing their time between lake, river and ocean systems. Juvenile sockeye spend up to two years in freshwater before heading out to sea. 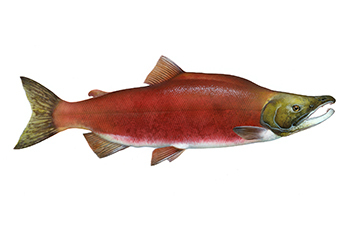 After 2-3 years in the ocean, sockeye return to their native streams and rivers to spawn, preferably near lakes. There are over 243 separate spawning sites for sockeye across the Pacific Rim, which can be grouped into approximately 80 management units (CU’s). Returns of sockeye salmon have been declining in recent years with certain subpopulations or stocks being placed on the IUCN Red List of Threatened Species. The species as a whole is not threatened but several of the subpopulations are at risk or local extinction. Habitat degradation, mixed stock fishing and shifting oceanic conditions are the main threats to sockeye salmon populations. These threats have had a much greater impact in the southern part of their range (Southern BC and the US) than in Alaska, where sockeye abundance is highest. Adding to confusion, the 2010 BC Sockeye run was one of the largest in the last 50 years. In Alaska, salmon fisheries are managed by the Alaska Department of Fish and Game. A major challenge in salmon fisheries management is the significant year-to-year variation in salmon run abundance. In both Canada and the US salmon fisheries managers establish pre-season estimates and then perform in-season assessments to determine catch limits. In both regions, conservation is the primary objective in management plans; however, these objectives need to be balanced with the social and economic requirements and obligations to all the various stakeholders, particularly Aboriginal peoples. Harvest methods used for sockeye are highly specific, so bycatch is considered low compared to total catch. Most commercial sockeye harvests operate as mixed-stock fisheries which can capture sockeye from several different stocks at once. This poses a challenge to managing stocks that are of conservation concern. Seine, Gillnet and troll fishing gear have minimal impact on marine habitats as they do not usually make contact with the seafloor. Removing salmon from the ocean and the decline of salmon returning to river systems may have significant ecosystem impacts. Marine and terrestrial mammals and birds rely on salmon for food and the forests adjacent to salmon bearing streams are closely linked to nutrients released from salmon after their death.